The Uneven-Grip Pull-up excels for developing one-arm and lock-off strength. As the name implies, this exercise offsets one hand 12 to 24 inches (30 – 60cm) lower than the other, thereby requiring the higher hand to pull more bodyweight than the lower hand. 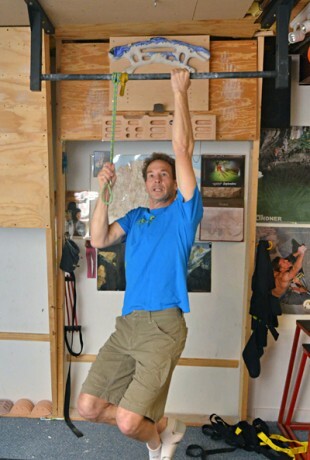 You can do this by simply looping a sling over a pull-up bar or extending one of a pair of free-floating rings (or similar). It’s best to learn the exercise with an opposing grip—do this by standing under the pull-up bar facing long ways with the high hand gripping the bar palms inward (thumb pointing backwards) and the low hand gripping the sling with a deep two-finger-pocket grip or pinching grip. From this bottom position initiate upward movement by pulling with both hands, however, focus on pulling hardest with the higher hand. 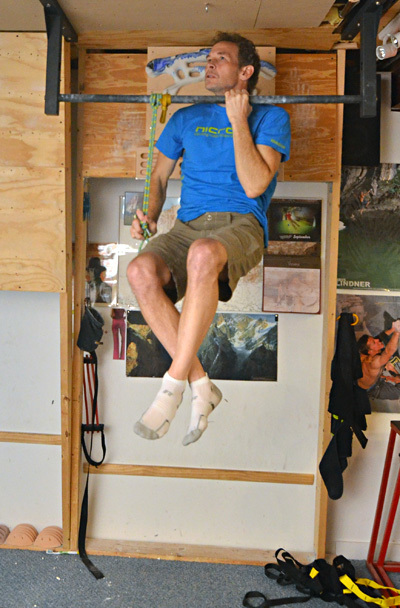 As you ascend past mid-height, begin pushing downward with the low hand to aid the pulling of the high hand. Finish by pulling the bar down along the side of your head to achieve a tight lock-off position. Hold the top position for one second before beginning a controlled descent. Stop short of reaching a straight-armed position and immediately begin the next repetition. Do three to five reps, then dismount and rest for two minutes before doing three to five reps with the other hand gripping the bar. Perform two to four (advanced) sets on each side. Begin Uneven-Grip Pull-up training with your hands offset by just 12 inches; increase the displacement when you can do five solid reps. Advanced climbers can do this exercise with both hands in a palms-away grip position. Do this exercise twice per week and, long-term, you’ll eventually develop enough high-end strength to do a one-arm pull-up!